I’m not normally a traditional person. I’m all about sharing things on social media and texting photos to friends and family. However, I’m very traditional about sending real, paper birth announcement cards. I love adding in the statistics (birth date, weight, height, etc). Most importantly, though, is that I like to select photos and design the card myself. Besides our annual Christmas card, it’s the only time I mail things to many family members. 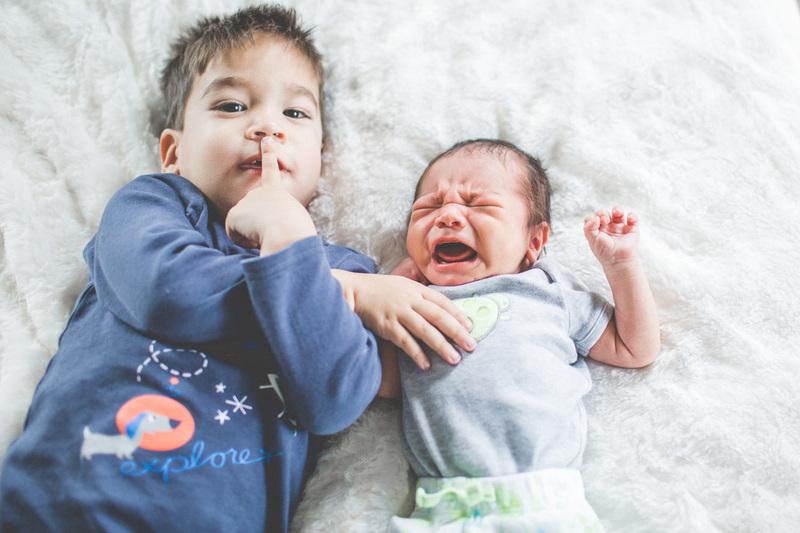 Our toddler came up with this pose as he was trying to soothe our screaming newborn. 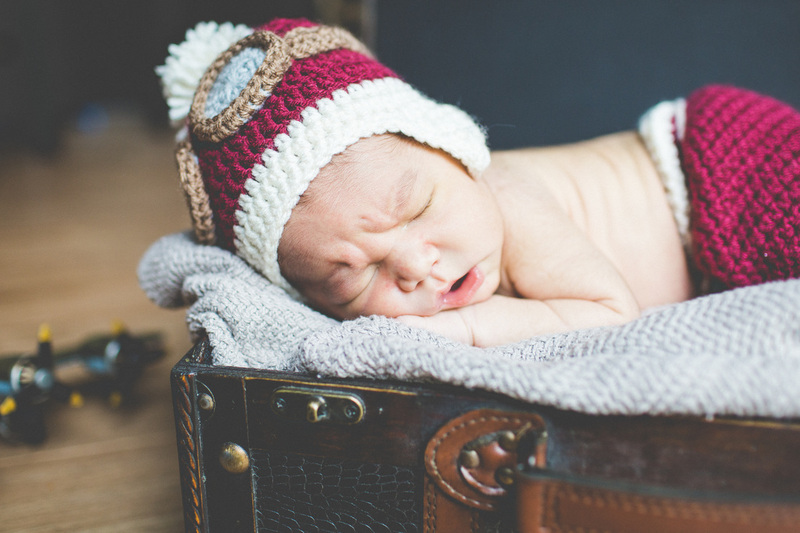 If you are able, it’s so helpful to hire a photographer to take newborn photos so that you and your family can be in the photos. My husband is a great photographer and I love the photos he takes of our kids, but I also love when he gets to be in the photos, too! We like to use the Happy Film Company here in Seattle because they know how to get relaxed, candid photos of our family. Sleeping baby. This shouldn’t be hard if you do photos within the first few weeks. Our newborn was awake for most of the shoot and then we ended up rocking him before doing the aviation-themed portion of our photo shoot. Close up details of hands and feet. They change so quickly that you will forget how small they were! Mom with baby. I like getting realistic shots of myself with my baby. Otherwise, all my photos are posed and usually taken on a cell phone. Dad with baby. There are usually lots of shots of Mom with the baby in those early months. It’s nice to get some shots with just Dad and baby because they interact differently and it’s great to capture that. Siblings with baby. I always love photos of siblings holding, kissing, snuggling or laying next to the baby. Even better if you can add a soft prop in there so siblings have a safe way to interact with the baby. Whole family. You will be surprised how few photos you will have of your whole family that aren’t posed Christmas photos. I like relaxed shots that show our personalities. We had our toddler sing “5 Little Monkeys” while jumping on our bed to keep his expressions genuine. Special family members: If you have the opportunity, it’s fabulous if you can include grandparents or even great-grandparents in photos with the baby. Even if you can’t coordinate for a professional shoot, take as many shots on your camera or cell phone so you have those photos. You won’t regret it. Something unique to your family. 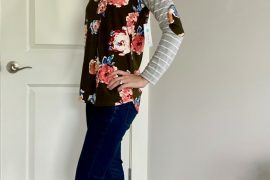 I am passionate about babywearing, so I really wanted to get some nice shots of me wearing my son. However, we had a really nice vibe going during the shoot and I decided to let go of that so we could get more photos of our whole family. But, I love that we incorporated our love of airplanes into the photo shoot. 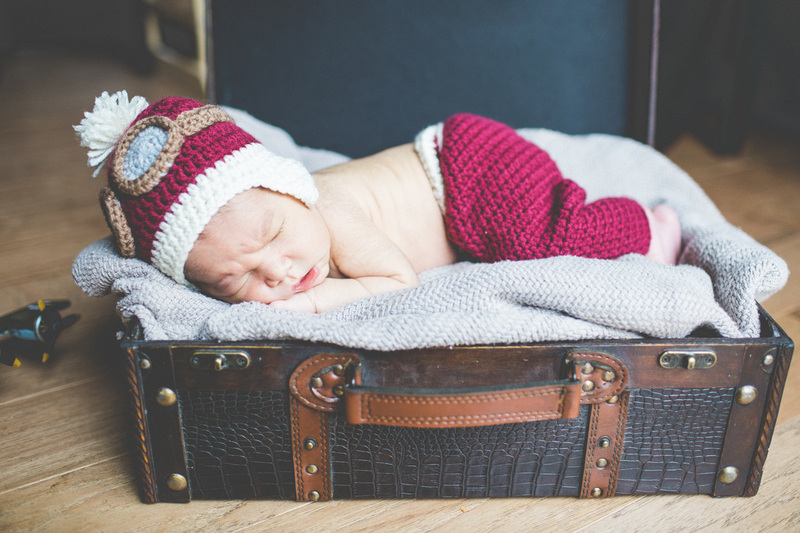 HandMadeCraftyOne sent us this crocheted aviator newborn outfit so we could create our travel-inspired newborn photos. Since my family is obsessed with traveling and our baby has a travel-themed nursery, we thought it would be fun to continue the theme through the birth announcement. Karen from HandMadeCraftyOne Etsy store sent us an aviation-themed crocheted outfit that was perfect for our photo shoot! I really like how soft the yarn was and that the pants were adjustable for skinny babies but could accommodate heavier ones. We plan on using the hat when we visit the Museum of Flight and other airplane-related outings for cute candid shots! I repurposed my vintage reproduction suitcase from our wedding and stuffed a Queen size blanket inside. I also repurposed a metal vintage-looking airplane to set the scene. 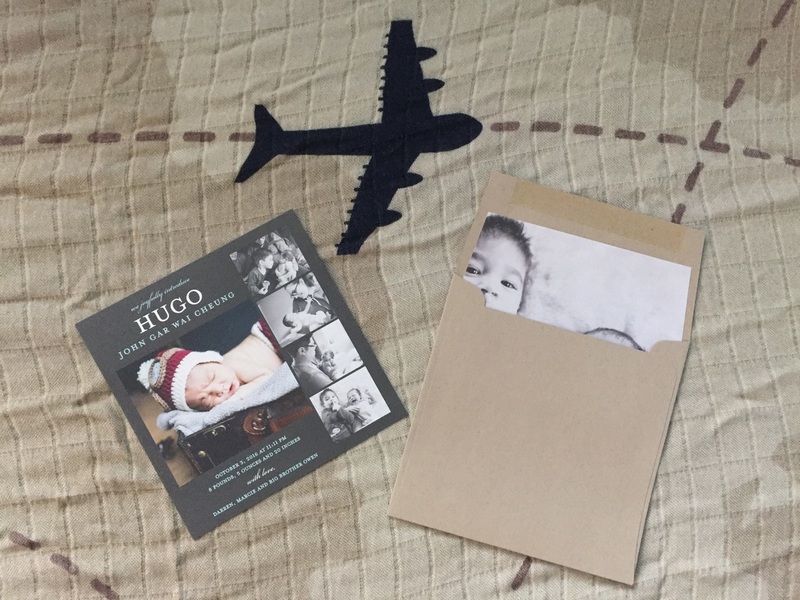 Tiny Prints sent me birth announcements, envelopes and liners that truly fit our aviation-theme. Even though it’s so easy to post birth announcements on social media, there is something special about sending something in the mail. I like being able to add personal messages to the back. Plus, it’s fun to see your baby’s photo on other people’s fridges when you visit them! With my oldest, he was in the NICU for awhile after he was born prematurely and when we finally got him home, one of the first things we did was take newborn photos for a birth announcement. For me, I really needed to do something to celebrate his arrival and move past the emotional journey we had endured. Creating his birth announcement was such a positive experience that I knew it was just as important with my second baby. I really enjoy using Tiny Prints because they have quite an extensive collection of designs, themes and options. 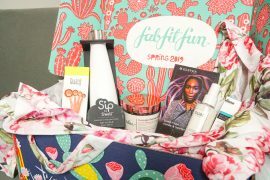 They also offer sales all the time and lots of fun add-ons and customization. They make nice keepsakes and you could even frame and add to the nursery. 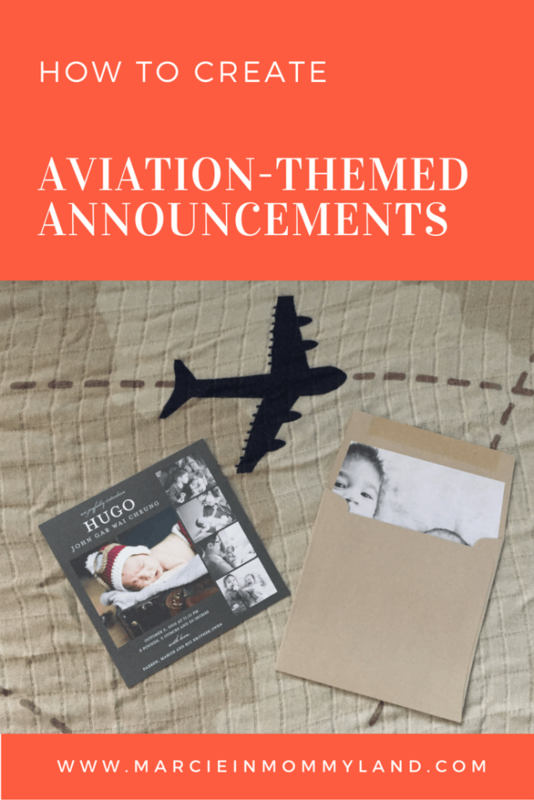 I picked this birth announcement layout because it highlighted the aviation-themed photo and there was a spot to fill in a photo-strip with 4 additional photos. This added to the vintage travel vibe I was going with. Additionally, they offer birth announcement pillows, which are pretty fun! 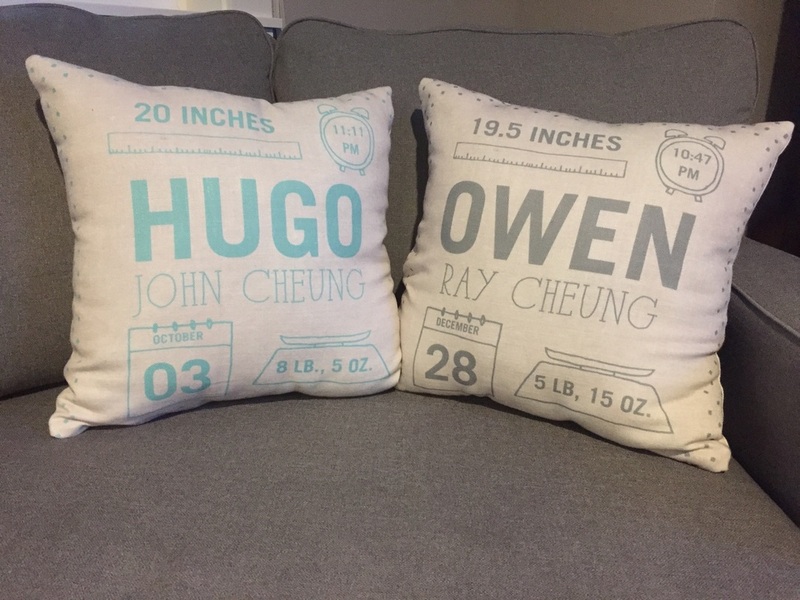 We love our birth announcement pillows from Tiny Prints! Another fun place to send extra birth announcements is to Disneyland or Disney World. My oldest son was born right before the Seahawks won the Super Bowl in 2014 and so I sent Pete Carroll our Seahawks-themed birth announcement and he sent back a congratulatory message and a Super Bowl key chain! This was really cool for our family and it was a nice addition to his baby book. I’ve also heard of people sending announcements to fan mail addresses for their favorite celebrities. I hope these ideas inspire you to create your own birth announcements that are just right for your family! Tiny Prints and HandMadeCraftyOne provided complimentary products.